A football club shop has been criticised for rebranding a £1 Easter egg and selling it for £7. 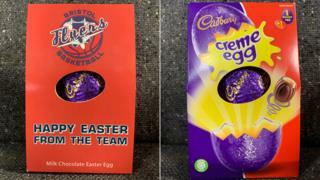 Bristol Sport, based at the Ashton Gate football stadium, is selling Cadbury eggs with Bristol City, Bristol Bears or Bristol Flyers cardboard covers on. The same egg, without the printed sleeve, can be bought from many supermarkets for between £1 and £3. Bristol Sport has declined to comment and the eggs are now no longer available from the online shop. The company, which was founded by Bristol City Football Club owner Stephen Lansdown, sells merchandise on behalf of Bristol City, Bristol Bears rugby club, and Bristol Flyers basketball team. The cardboard sleeve on the £7 egg slides off to reveal a standard Cadbury egg underneath. Also available in the shop is a Bristol City-branded Toblerone bar for £12 which, without the cardboard sleeve, appears to be identical to one bought in a nearby supermarket for £3.50. Fans expressed their anger on social media, labelling the eggs "embarrassing" and a "rip-off". Bristol City supporter Michael McGuinness said it was embarrassing and he "had to bring the matter up". Wayne Spirrell described the packaging as a "poor effort". Video Shrinkflation: Have our snacks been getting smaller?